Ian Shepherd, a respected British mastering engineer, will be familiar to many as the champion of Dynamic Range Day (http://dynamicrangeday.co.uk), and as owner and resident guru on the Production Advice web site (http://productionadvice.co.uk). Dynamic range and the perception of loudness are the subjective considerations of the mastering engineer’s trade, but quantifying these parameters has always been difficult. To address this, Shepherd has worked for many years with plug-in designer Ian Kerr of MeterPlugs to develop a variety of metering and monitoring solutions. Two of the resulting plug-ins have already been reviewed in the pages of Sound On Sound: Perception in July 2014, and the K‑Meter in October of the same year. These four screen captures show how Dynameter displays the long- and short-term dynamic range for four very different masters. This is a track called ‘Samurai’ by ’80s metal band Grand Prix. The remaster is heavily limited and sounds awful! 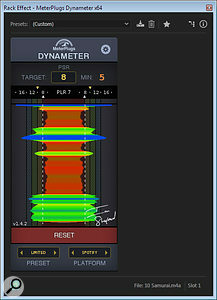 With a PLR reading of 7 and a minimum PSR 5, it will sound quiet and feeble in a loudness-normalised regime.The most recent addition to the family is a unique and genuinely ground-breaking plug-in called Dynameter: an intelligently focused metering system designed to reveal how dynamic a music signal is, with the aim of allowing the user to achieve the ideal track dynamics for a given genre or listening platform. This is now critically important because the growing take-up of loudness normalisation on streaming platforms, portable music players, and in broadcasting means that chasing absolute loudness is no longer beneficial in helping a track to stand out. In fact, it’s positively counter-productive and, in the loudness-normalised world, it’s the dynamic tracks that really stand out! Sadly, few metering systems provide a reliable measurement of musical dynamics. Of those that do, the most popular are probably the Brainworx BX_meter and the very similar TT meter from the Pleasurize Music Foundation. Like Mastering The Mix’s Levels plug-in, both of these meters offer a dynamic range measurement that is independent of absolute signal level, and in both cases, it actually corresponds to something called the ‘crest factor’. Derived from the difference between the peak and RMS levels of a signal, the crest factor relates strongly to the waveform shape, and that can provide useful clues about how much a musical signal has been dynamically compressed or limited. Importantly, this measurement is quantifiable and repeatable, so it makes a really handy tool when mixing or mastering. In practice, the smaller the crest factor value the more ‘squashed’ the music has become. Here's a better CD remaster: Supertramp’s ‘Bloody Well Right’. With PLR 16 and minimum PSR 8 it works well in all loudness-normalised regimes.Ian Shepherd has been a staunch and vocal advocate of the usefulness of this type of metering for many years, and in developing the Dynameter plug-in with Ian Kerr, has extended and improved upon it in several important and beneficial ways. 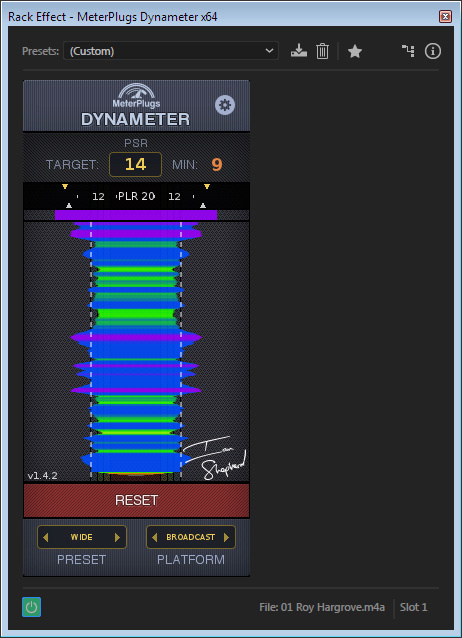 As a result, Dynameter makes it much easier to appreciate and optimise the dynamics of a track for the loudness-normalised world we’re steadily moving into. Much of the underlying technology in this new metering system is derived from the ITU-R BS1770-4 loudness algorithms employed in other MeterPlugs plug-ins, too. Dynameter is available in AAX, AU and VST 2.4 formats, all in both 32- and 64-bit forms, compatible with all current Mac and Windows operating systems. Installation defaults to an online authorisation process, although an offline alternative is available if required. 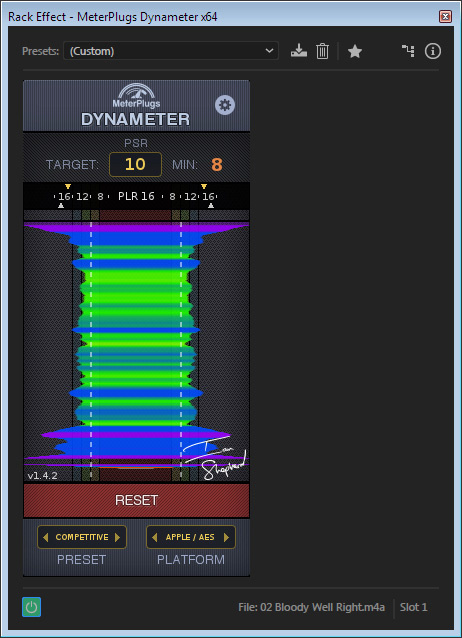 In operation, the Dynameter plug-in is simply dropped into a stereo output bus in the DAW, and its graphical interface displays the signal dynamics moment by moment, both numerically and graphically, along with a history chart. At a technical level, the most important difference between Dynameter and the crest-factor meters described above is that Dynameter displays the peak-to-loudness ratio. This is a subtle variation, but one which makes its use in the loudness-normalised environment far more accurate and meaningful. 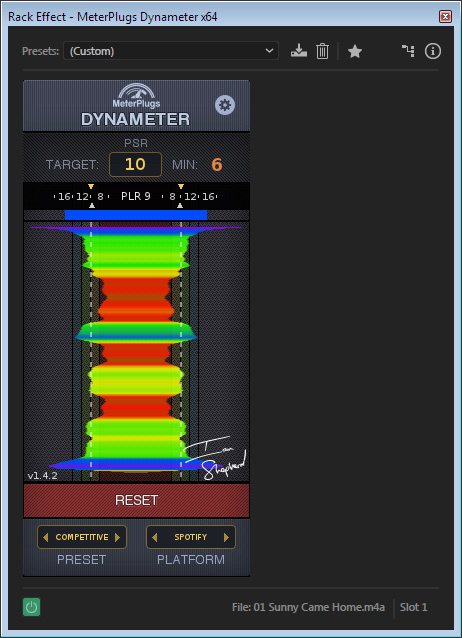 Actually, Dynameter provides two peak-to-loudness values, called ‘PSR’ and ‘PLR’. As you might expect, the P refers to the signal’s peak level, and the R to the ratio. For the technically minded, it’s worth noting that the Dynameter deliberately uses the sample-peak level rather than the true-peak, to avoid artificially inflating the peak-to-loudness values for signals with inter-sample peaks (which might become clipped on replay). The ‘S’ in PSR refers to the Short-term loudness: a three-second sliding window based on the ITU-R BS1770-4 short-term loudness calculation. The ‘L’ in PLR, meanwhile, relates to the (‘long-term’) Integrated loudness value calculated over whatever continuous time period the meter is measuring the audio (typically an entire track or maybe even a whole album). Of these, the PSR value is probably the more important, and it is this measurement that is displayed graphically as a coloured horizontal bar of varying width. As it expands and contracts it also leaves a trail moving downwards to document the dynamic history of the music, and the aim (in the simplest terms) is as much as possible to keep the signal outside the dotted guidelines representing the minimum target PSR value. This is a very dynamic jazz track from Dave Brubeck with solo trumpet: PLR 20, minimum PSR 9. Very wide dynamics mean it will probably be a little quiet or peak-limited over most loudness-normalised regimes.The graphical user interface is quite simple once familiar, although some aspects are not immediately obvious, and a quick read of the well-written manual is strongly recommended. A box at the top of the plug-in contains the target PSR value: this can be entered manually, but would more usually be set by choosing an appropriate Preset option via a button at the bottom of the window. 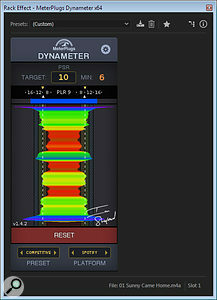 Four presets are provided: Wide (PSR 14), Balanced (12), Competitive (10) and Limited (8). The Competitive setting corresponds to the kind of dynamics associated with classic tracks from the ’70s and ’80s, before the ‘loudness war’ took hold. The Competitive preset also represents Shepherd’s standard recommendation for loudness-normalised applications, with the Balanced and Wide presets being appropriate for very naturalistic tracks, or when mixing. The Limited setting would be more appropriate when aiming for maximum loudness in a peak-normalised environment, but PSR values lower than eight would tend to lack punch and dynamic impact when heard on a loudness-normalised system. PSR values lower than 10 are likely to result in the track being turned down in level by all current streaming platforms. Ideally, then, the measured PSR value for the track should stay at or slightly above the target value for a given application, and to help keep track of that, a second numerical readout alongside the target box displays the minimum recorded PSR value since the last time the meter was reset. A second button at the bottom of the plug-in selects the ‘Platform’ for which the music in intended, and this is used to determine the target PLR value display and the position of corresponding indicators (small yellow downward-pointing arrows) on the horizontal scale. The options are Broadcast TV (22), Apple & AES recommendation (15), Tidal (13), YouTube (12) and Spotify (10). The measured PLR value is shown as upward-pointing white triangles on the horizontal scale, and since the PLR value is measured across the entire duration of the track, the measured values tend to be slightly higher than the short-term PSR values. Finally, Shawn Colvin’s ‘Sunny Came Home’ is typical of a modern peak-normalised track. PLR is 9 and minimum PSR 6. Choruses are more heavily compressed and very visible between verses.The vertical dynamic history time scale can be adjusted by clicking and dragging up or down, which allows short time periods to be examined in more detail, while also enabling an overview of a complete track or album to be obtained, if preferred. To locate any sections of interest on the graph, the cursor can be placed over the history chart, whereupon the corresponding track time is revealed by a timecode display in the bottom left corner, which can be related back to the DAW timeline. The display width can also be adjusted by clicking and dragging while pressing the Shift key, and clicking on the red Reset bar clears the history chart and resets all the numerical displays. As with any meter, effective use relies upon correct interpretation, and it inevitably takes a little time and effort to understand what Dynameter is showing. However, listening to a wide variety of commercial tracks while observing Dynameter’s measurements and display helps to relate musical dynamics to meter readings and makes sense of the information pretty quickly. To make the best use of the dynamic range available on any given platform, the measured PLR value should approach, but not exceed, the target. If the measured PLR value does exceed that of the platform, the track may end up being turned down a little to avoid clipping, or the platform might impose some peak limiting (Spotify is the only major streaming service that does so at present). However, in general, if the PSR value is between eight and 10, the loudest sections will typically still be replayed just as loudly as anything else (and as loud as the platform allows). Comparing the PSR and PLR measurements can be very informative, too. For example, low PSR values indicate a more ‘squashed’ sound character, and low PLR values indicate little dynamic variation across the track. Similar PSR and PLR values suggest little variety in the music’s dynamics, whereas a large difference between them indicates greater dynamic variation (for instance, quieter verses and louder choruses!). The manual provides some very helpful guidelines on interpreting these measurements, but at a simplistic level, the general aim is to create a track with good short-term dynamics and good dynamic variety throughout, and that means it should meet or exceed the target PSR — to achieve an appropriate dynamic range — while also reaching the target PLR value to make full use of the dynamic range available in the platform. This probably all sounds terribly complicated, but actually, once you’ve got your head around what the meter is showing, and have learned to relate what you see to what you hear, it’s a very powerful reference tool. The key to its effective use is to choose the most appropriate dynamics and platform presets to set the optimum target levels. With that done, you simply aim to create a mix that is displayed as a varying column of orange, green or blue, wider than the vertical guidelines, and with the PLR pointers close to, but just inside, the yellow target pointers. 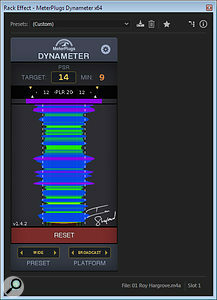 As it says in the manual’s introduction, Dynameter is not a loudness meter, but it does show how dynamic the music is in real time, beat by beat, or over a whole track or album. As the loudness-normalisation ethos spreads across the music consumption platforms, the raw loudness of a track becomes increasingly irrelevant (because the platforms match the perceived loudness of everything automatically). Instead, it is the musical dynamics that determine the audible differences between tracks, with more dynamic tracks sounding better, more involving and more exciting. Heavily compressed, peak-limited tracks end up sounding quiet, flat and uninspiring by comparison. 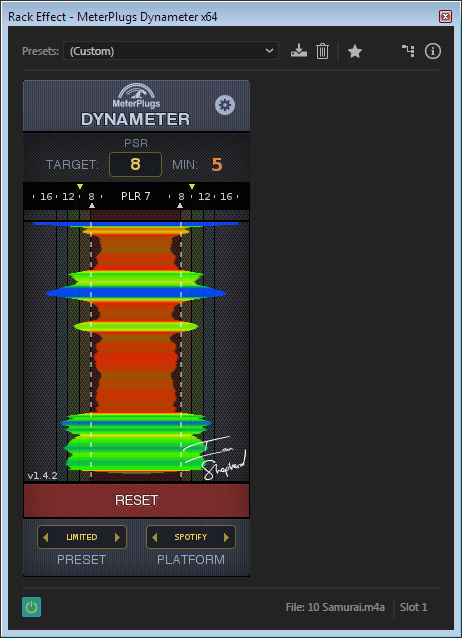 Consequently, Dynameter is a superbly focused metering tool that helps enormously in establishing the optimum dynamics for any genre and platform. MeterPlugs’ marketing tagline is “Stop worrying about loudness, start succeeding with dynamics”, and I’d say that is excellent advice. 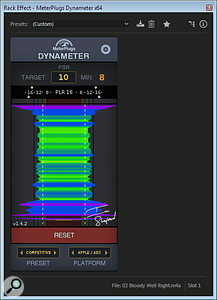 Dynameter will be a permanent fixture in my DAW output channel from now on. Very highly recommended. Mastering The Mix’s Levels, Brainworx’s BX_Meter and TT Meter are the closest alternatives I know of, although they all measure and display crest factor, rather than relating directly to the ITU loudness measurements that determine the playback levels on loudness-normalised platforms. A unique design that is perfectly focused on the requirements of modern music production. Displays are easy to read and interpret. Precise numerical measurements for simple track comparisons. Some learning required to get the best from it. A genuinely unique and purpose-designed specialist metering tool that is a great aid to optimising music dynamics to ensure maximum effectiveness when played on loudness-normalised platforms.